3701 Pender Drive office building by Miller & Favazzo Properties - quality real estate development and property management. 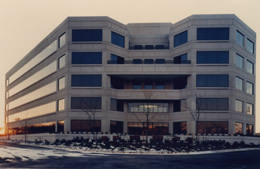 This Fairfax County building was designed by Skidmore, Owings, and Merrill and features a floor plate with beveled corners and exterior balconies, and affords 10 corner offices per floor. Developed in 1985, this contemporary 100,000 SF building features a textured precast concrete skin.